Nowadays, clock time measures events. Yet in the past, events measured time. 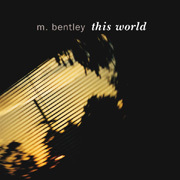 On his album This World (55'28"), M Bentley presents two extended pieces dealing with our fluctuating perception of time. "Chronos & Kairos" (40'21") is a tranquil, somnolent ambient meditation in six movements. On this piece, Bentley opens a space and softly fills it with sound. Within a dreamlike stillness a line may be traced along the vague arc of this work's odd tonal narrative. "Chronos & Kairos" is a quiet and dominantly electronic music of an impressionistic nature. Minus the accompanying video, the listener is inundated with his or her own mental images. "Import" (15'00") deals less with harmonious tone clusters and comforting atmospherics than it does with dramatic timbral and thematic shifts. Sources such as field recordings, found sounds and muted drum loops are juxtaposed with a range of transmuting synthesized and sampled sounds to produce a fascinating surrealistic soundscape. Gritty, soothing, eerie, antiseptic, bionomic and sometimes minimalistic to the point of dissolving, This World is an interactive ambient experience which will be regarded as completely unique with each encounter.